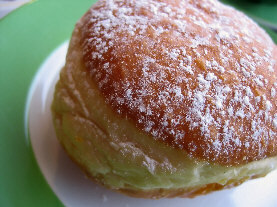 Berliner are fist-sized pastries, made from a sweet yeast-dough, and deep fried. They are filled with jam (such as raspberry, plum, apricot) or a vanilla cream (usually in Bavaria). They are topped with powdered sugar, granulated sugar, or icing. The dough is made from yeast, flour, butter, eggs, milk, and sugar. The filling is jam (such as raspberry, plum, apricot) or a vanilla cream (usually in Bavaria). They are topped with powdered sugar, granulated sugar, or icing. Berliners are best eaten fresh - made the same day. They lose their freshness quickly. The Berliners claim to have invented this fried pastry. Although fried pastries date back to Roman times, there has been a long tradition of it in Berlin. As early as the 15th century, bakers sold the Berliners in carts throughout the city. Back then, the Berliner pastries were not yet filled. In the 16th and 17th centuries, the population in Berlin grew very quickly and, because of this, the bakery industry flourished. To meet demand, the bakers began frying the pastries in a pan over an open flame. It was this preparation method that gave the pastries the name "Berliner Pfannkuchen." In Berlin and in parts of Eastern Germany, these donut-like pastries are known as "Pfannkuchen." In Northern Germany and parts of Baden-Württemberg, they are known as "Berliner." In Aachen, they are known as "Puffel." In and around the Ruhrgebiet region, they are called "Berliner Ballen." In Franken, they are called "Faschingskrapfen." In Hessen, they are known as "Kreppel."